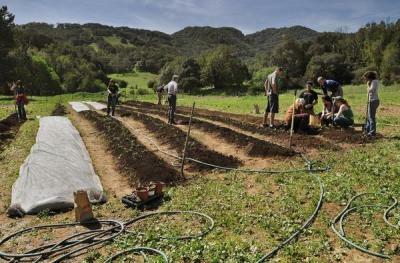 A new 5.8 acre working farm at College of Marin Indian Valley campus is redefining landscape design classwork. Serving students in the Agriculture & Environmental Science and the Environmental Landscaping departments, the farm is both a classroom and a professionally managed market farm. Produce is sold at an on-site stand, delivered as farm boxes to students on campus and donated to local food banks. Many ag schools have on-campus farms, but what sets the College of Marin program apart is the inclusion of agriculture as a topic in landscape design, with credit classes offered in 'Principles of Organic Farming and Gardening', among others. Central to the program is the concept of 'agroecology', or the idea that the ways people transform the landscape can be used to restore the land as well. Broadening this idea to apply to landscape design offers interesting areas of inquiry - in what ways do gardens, commons and parks relate the transformation of the land to an inherent revitalization of the land? How do we understand these landscape typologies to operate as ecologies in the broadest sense? Farming is an ongoing work of process with the land, a daily physical shaping of an environment. Could the maintenance of designed landscapes be understood as part of an ecological process as well? How could designers use the lens of organic farming to anticipate maintenance structures that build, rather than simply maintain, a landscape? Quoted in the Independent Journal, Nanda Schorske, the campus dean of workforce development, summarized the link between organic farming and landscape design as such: "People who understand the responsibility for using our resources want gardens rather than lawns."